When you need the most luxurious limousine bus services, look no further than our Burlington party buses. We have the widest and greatest selection of bus limos in the city that can offer you elegant transportation like no other. Indeed, our vehicles are so amazing and world-class that many of our customers keep on coming back for more. When you take a ride on a party bus in Burlington, you are taking the most amazing and luxurious method of transportation that is available today. Many of our awesome limousine buses come equipped with facilities such as an onboard bathroom, laser light ceiling, dance floor, multiple minibars and more. It is easy to realise just how awesome it is to use our vehicles because even for special occasions they seem like a big luxury. Using the most elegant transportation also means that you will make a very big impression on your friends and family. Furthermore, you'll also make an impression on everyone who is walking in the streets. For weddings, this can be a great feature because the bride and groom always want to remember this day as something extra special. In fact, more brides nowadays are using limo buses for their transportation than any other vehicle. Our team of trained chauffeurs are standing by to help you enjoy a great event. They are professionals who are experts at what they do, and they work hard to make certain that all your travel and transportation needs are met and exceeded. Furthermore, our managers and customer service reps are always available if you have any issues, or if there are any unforeseen circumstances. We'll do our best to accommodate all your requests to ensure that your prom, wedding or any other type of event is perfect. We cannot plan your entire event for you. However, we can ensure that you receive the most exciting ride that you have ever had in your life. 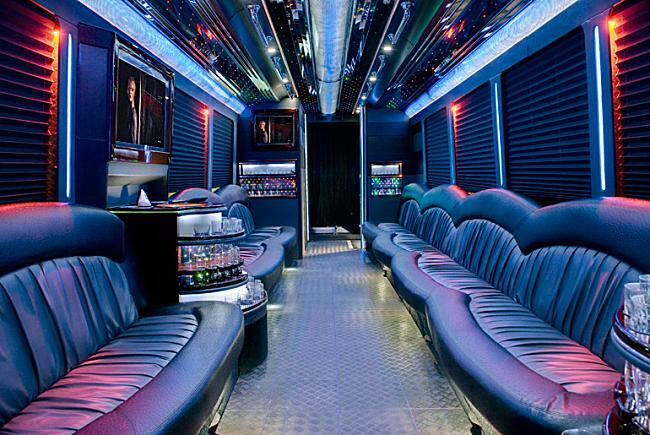 Just call us and find out more about the great rentals that our party bus Burlington service can provide to you. You will be glad that you contacted us! Make sure to take lots of pictures because they'll look great in our awesome vehicles.